Restaurants that cater to the kid in all of us tend to get a lot of family traffic. That's certainly the case for us. 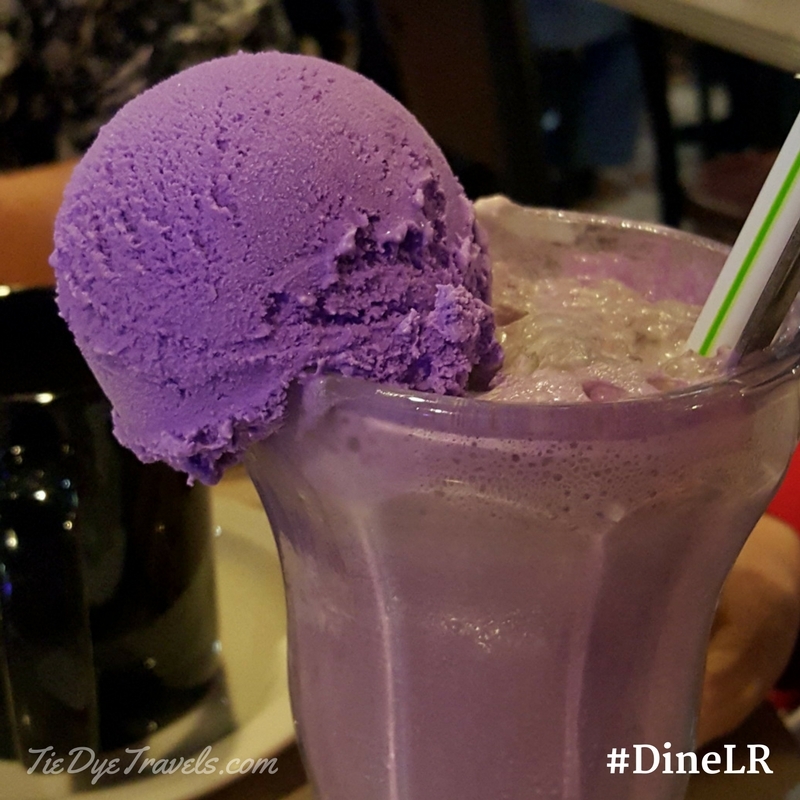 For celebrations and the like, or just for a special treat, there's always the Purple Cow - which not only has the eponymous milkshake on the menu but a whole lot of different eats to boot. 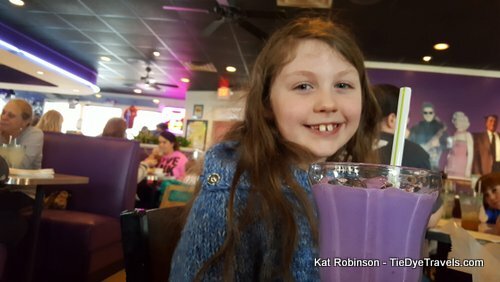 A caveat - I enjoyed my share of Purple Cow sodas, shakes and ice cream creations before I ever became a parent myself. 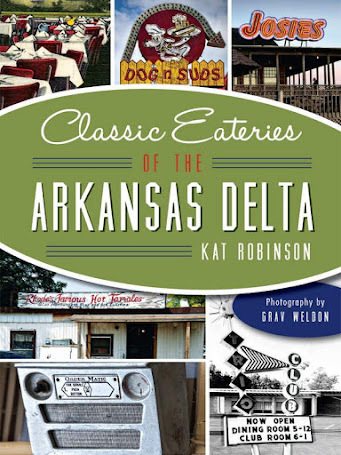 I’ve been a fan ever since the first location opened on Cantrell Road back in 1989 - the year I got my driver’s license. 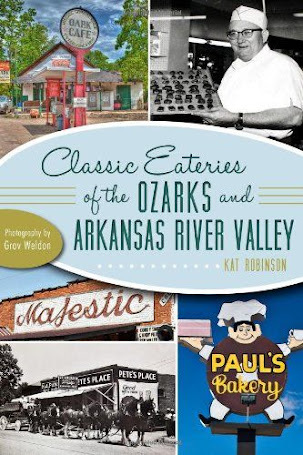 Businessman Ed Moore and Chef Paul Bash created this retro 50s style diner. Bash was best known at the time for Jacques and Suzanne’s, the state’s premier French fine dining restaurant that he'd closed by choice a short time before. 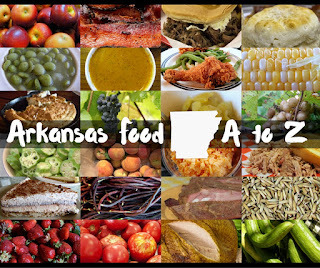 It took off - and today there are locations of The Purple Cow on Chenal and in Hot Springs and Conway, too. 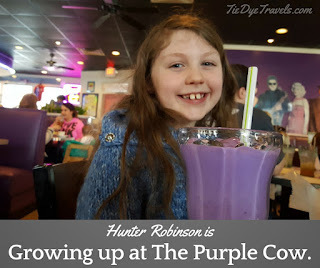 It occured to me a couple of weeks ago, when my mom and I took my daughter and her best friend to the restaurant to celebrate the first day of school, that I have an entire chronology of this child growing up at Purple Cow. That chronology actually begins with this photo. At the time, Hunter wasn't here yet. 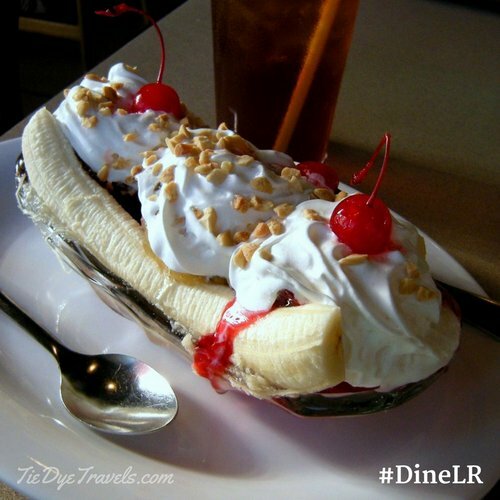 It was July 2008, I was pregnant and all I could think about was this banana split. So one Sunday afternoon we went over and sat in the back corner and enjoyed said banana split. It was decadent and wonderful - and, strangely enough, the photo itself became one of my most recognized pieces. This was a perfect banana split - scoops of Yarnell's chocolate, vanilla and Homemade Strawberry ice cream under chocolate sauce, pineapple sauce and strawberry sauce respectively, that all under whipped cream and peanuts between two halves of banana... with cherries on top, of course! Hunter came along in December 2008, and she was still a babe in arms when I photographed this patty melt and orange cream milkshake. You can see her hand in the background - she was being held at the time. This patty melt wasn't quite the melted-together thing I'm used to but the onions were grilled nicely. 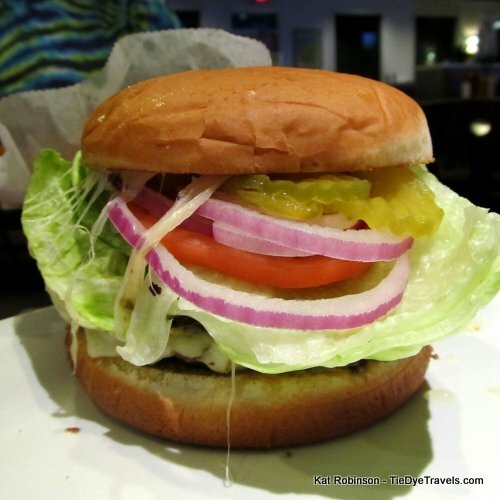 It was different for me because it came with all the fixings on the side, like a regular burger. It was nice to have the option. That orange cream milkshake, though - that was so good. Orange soda and vanilla ice cream. Can't beat it. Hunter has always been an amazingly portable child. She's been going to restaurants with me since she was less than a month old. It wasn't long before she and I started tackling things together, just the two of us. 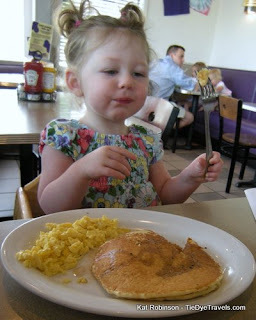 In May 2010, she and I tackled brunch at The Purple Cow, as part of a whole Saturday of mother-daughter fun. And The Purple Cow's brunches are pretty dang good. 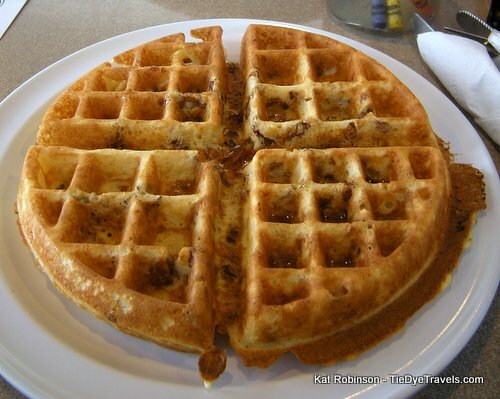 This pecan waffle (that thing above) is spot-on, and Hunter got to utilize her growing utensil skill on pancakes and eggs. Good times. Hunter's not the only one who loves the diner. I brought Grav along for the ride in the summer of 2010 as my photographer. 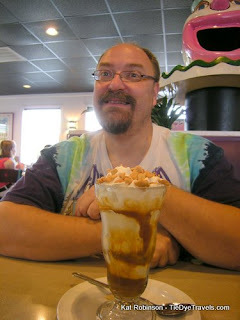 That didn't keep me from snapping him with a cashew caramel coffee sundae at the end of one of our trips that August. We'd just spent 60 hours in 100 degree heat in the southern part of the state, shooting and researching for 16 different stories,and at the end of it all cooling off with ice cream seemed a reasonable idea. I happened to shoot my favorite soda that day, too - the coffee soda. Yes, I'm a coffee lover, and I'm also an old fashioned soda lover. 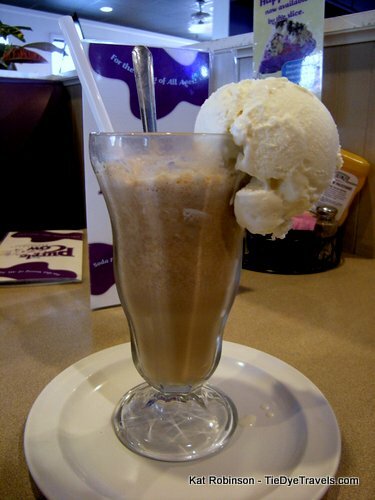 Milkshakes are great but sodas are lighter - ice cream and soda water, sure. And they're just divine. Besides, you can't go wrong with caffeination. So 2011 was the year of burgers for me. I tried nearly 100 in the span of those 365 days, and I wrote about a lot of them. Purple Cow was on the list, and with a slice of your choice of cheese, it's a pretty good diner-style burger. The buns are seedless and the fixings are always on the side. I didn't eat those onions, though. I mean, raw onions and me... are just not a good idea. June comes along, and heartbreak ensues. Yarnell's Ice Cream, which creates the proprietary Purple Cow ice cream, closed down. 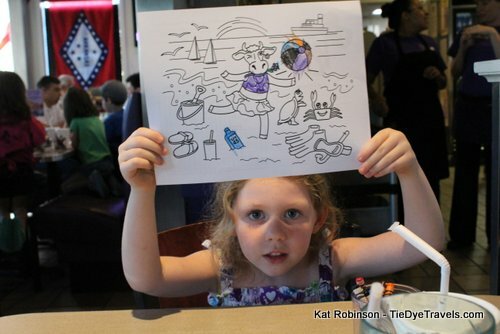 There was shock, there were tears - and there was a really big concern about where The Purple Cow would get that purple ice cream. 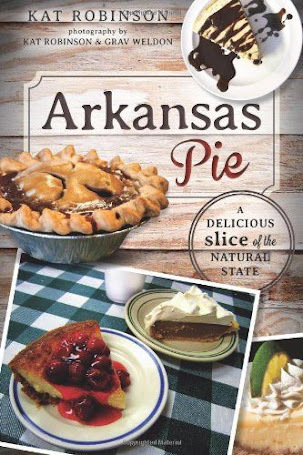 I know some of it was stocked back, but I also remember a short time when Yarnell's didn't provide the ice cream for the restaurants. That's a dark time. Fortunately, Yarnell's wasn't even closed a year, and when it came back it was right back to providing The Purple Cow with its scoops. 2013 - another afternoon with Hunter, this time after school. She looks forward to coloring the sheets even now, and even then she knew something was wrong if she didn't get her cup of crayons the moment we sat down. 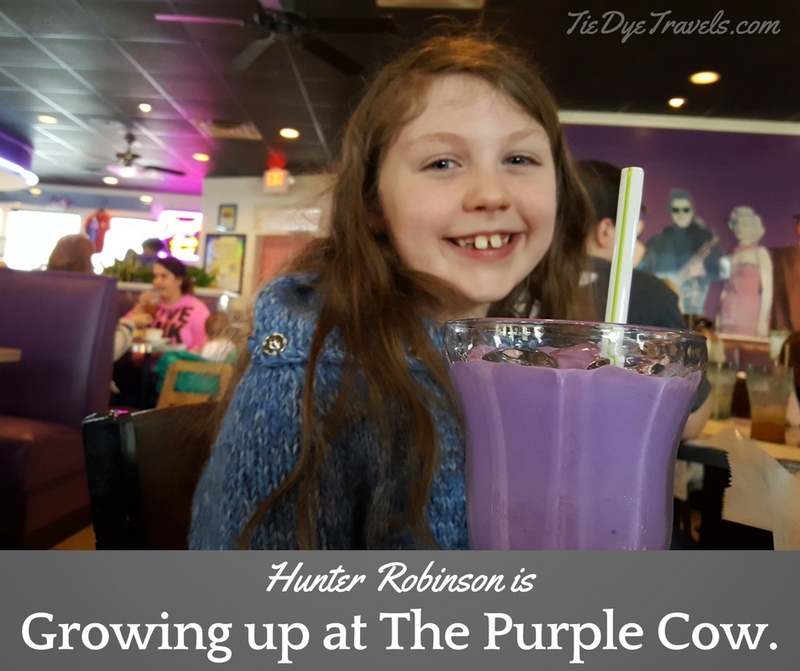 She had to have her Purple Cow shake as always, and a kids basket of corn pups and fries. This particular time, I tried out the soup and salad. I like the basic salad at Purple Cow because it has red and yellow bell peppers. I like those. They're awesome. 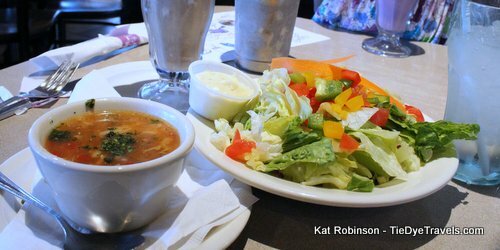 The vegetable soup is pretty darn good, too, and the perfect - the PERFECT - cure for brain freeze. Which is what I get when I get too excited about my coffee soda. We spent Halloween evening after trick-or-treating with a sweet nightcap. 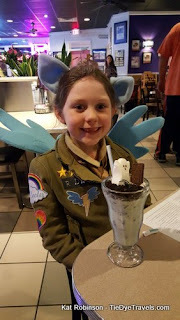 The seasonal special included "dirt," and even though Hunter had already taken off her wig she was still pretty sharp in her Rainbow Dash cosplay. See, Purple Cow tends to create all sorts of seasonal specials - whimsical treats like this boo-tastic wonder with marshmallow ghost and graham cracker gravestone. Kids eat that stuff up. Literally. 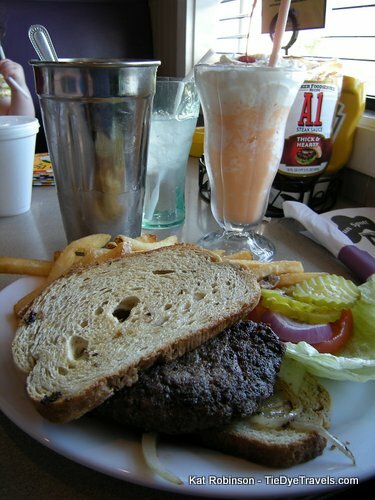 Mom tried one of the Purple Cow sodas that night - another favorite. See, Purple Cow ice cream is a very rich vanilla - Hunter claims it has a bit of a marshmallow flavor to it. I see her point, but I think she's tasting some double-strong vanilla goodness myself. All I really know is that I can only get this particular purple ice cream at The Purple Cow. So are you starting to see what I'm getting at? We eat at Purple Cow a LOT. 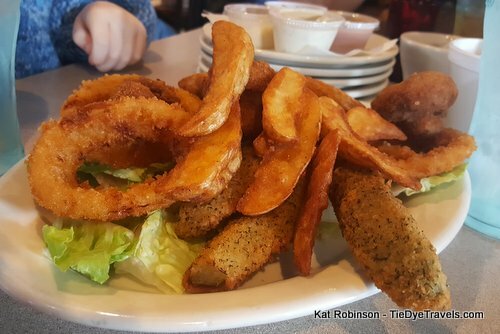 I know getting the appetizer sampler's always a winner, since Hunter and Grav will fight over fried pickle spears and seasoned fries while I swipe the fried mushrooms and onion rings. 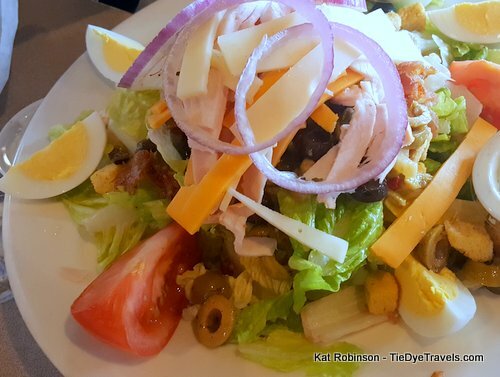 I know my salad loving friends can find something good, like the chef's salad. 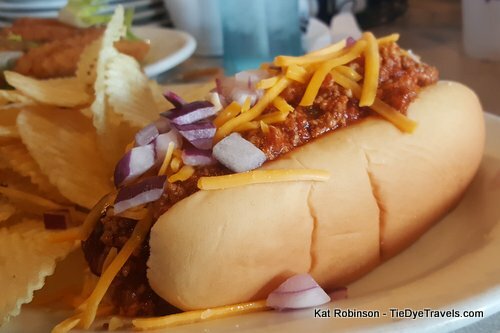 I know when I want an all-beef chili dog, The Purple Cow can totally hook me up. And I know when I go back and look through all the photos I've taken there over the past eight years, I can see how my daughter has grown up on me. 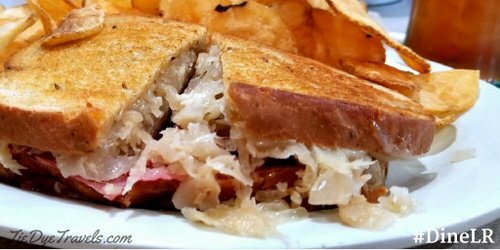 a rather good Reuben sandwich. Ever true to the nature of being who they are, the Russian dressing came on the side, so I could put on just as much as I wanted to. Because that's the thing - The Purple Cow caters to folks who are particular about what they want to eat. Kids fit that strongly. Over the years, Hunter has gone from eating everything except grapefruit to being extaordinarily picky (she doesn't like beets, celery or melted cheese unless it's on a pizza or in cheese dip) and back, and we've never had to encourage her to eat what's in front of her here. For parents, that's always a good thing. 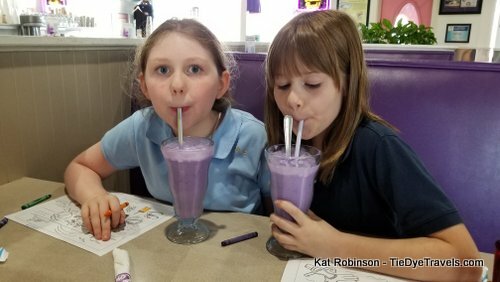 And besides, the folks there don't even blink if you ask to split a Purple Cow milkshake for a couple of elementary school girls. Craving ice cream? Or just want to see what I'm talking about? 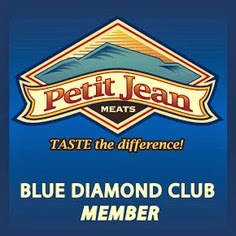 Head over to the website for locations and the menus. I think you'll rather enjoy this place. Hunter sure does.